This website is dedicated to people who were associated with the Upper Beaconsfield area at some time in their lives. Some were farmers or orchardists, others were traders, and a large number of people from Melbourne spent their holidays in our town. It is a collection of tidbits of information about the people of Upper Beaconsfield, found in the newspapers of the day, in documents at the National Archives, the Public Records Office, State Library, and on the Internet. It also draws on historical articles in the Upper Beaconsfield Village Bell. This is only a small selection of the people who called Upper Beaconsfield home, and the research is a work in progress. Do you have any relatives who lived in Upper Beaconsfield? Do you have any photographs of Upper Beaconsfield? I'd love to hear from you. Click on my name below to send me an email, or contact me on facebook. If you can't click on my name below send an email to info at the domain this website is on. This beautiful book, originally published in 1899, has been re-published. 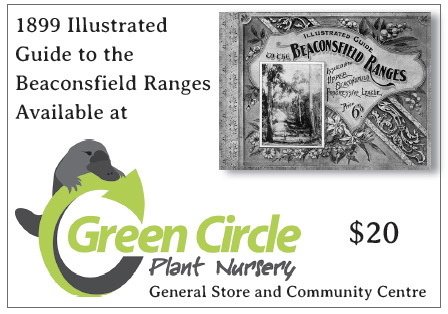 Available at the Green Circle Plant Nursery, The Upper Beaconsfield Community Centre and the Upper Beaconsfield General Store for $20. Or contact me if you would like a copy posted to you.